the scars are arranged in an almost whorled pattern; in others, they are borne in a low helix. The ligulate micro-phylls are narrow and measure up to 25 cm in length. Cones, known from both compressions and petrifactions, consist of sporangia borne adaxially on sporophylls whose distal laminae are greatly elongated. The cones (Bothrodendrostrobus) are bisporangiate, with trilete microspores toward the apex and megasporangia toward the base, each with up to 20 megaspores. Megaspores of Bothrodendron have numerous spines that cover their surfaces. Paralycopodites (FIG. 9.93) differs from both Diaphorodendron and Lepidophloios in having reduced, persistent scalelike leaves that appear morphologically intermediate between these two genera (DiMichele, 1980). 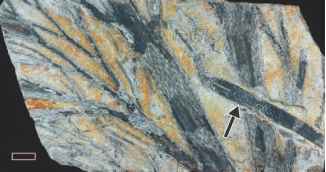 Stratigraphically, the genus extends from the Lower Carboniferous to the Middle Pennsylvanian (Westphalian D). 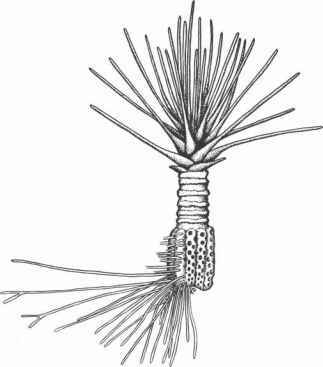 Paralycopodites has been reconstructed as a small tree that produced deciduous lateral branches. The diameter of the siphonostele in P. breviformis was ~3 cm; the most distal branches were protostelic. Vegetative remains are consistently associated with strobili of the Flemingites type. Pearson (1986) has suggested that Paralycopodites is the same plant that was initially described by Witham (1833) as Anabathra. Another common lycopsid believed to be a progenitor of, or have affinities with, the lepidodendrids is Sublepido-dendron songziense from the Upper Devonian of China (Q. Wang et al., 2002, 2003b). It has small, vertically oriented leaf bases arranged in a tight spiral arising from a stigmarian rhizomorph; branch scars are of the Ulodendron type. The stem has an ectophloic siphonostele with fibers in the pith. 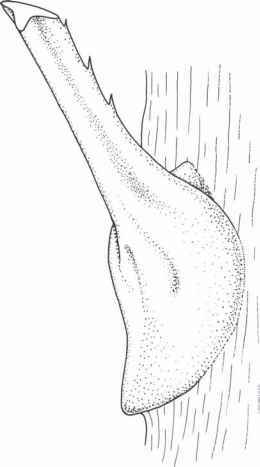 Strobili are of the Lepidostrobus type and borne at the tips of lateral branches (Q. Wang et al., 2003a). A second species in that genus, for which stems and branches (described as S. wusihense), and strobili (described as L. grabaui ) have been reassembled from isolated parts, is Sublepidodendron grabaui from the Upper Devonian of the Wutung Formation (Famennian) of China (Y. Wang and Xu, 2005). A cladis-tic analysis of Sublepidodendron and related taxa suggests that members of this genus possess many synapomorphies with phylogenetically more advanced genera in the families Sigillariaceae, Lepidodendraceae, and Diaphorodendraceae, rather than the order Protolepidodendrales as previously thought (Q. Wang et al., 2003b). Early Mississippian deposits throughout the world, including Germany (Mägdefrau, 1936), Bear Island, Spitsbergen (Schweitzer, 1969, 2006; Murasov and Mokin, 1979), China (Feng et al., 2004), Japan (Kimura et al., 1986), and the Himalayas (Pal, 1977). Leptophloeum rhombicum is an arborescent lycop-sid which was distributed worldwide during the Late Devonian (see references in Q. Wang et al., 2005). Based on literature data and material from the Frasnian (Upper Devonian) Huangchiateng Formation of Hubei, China, Q. Wang et al. 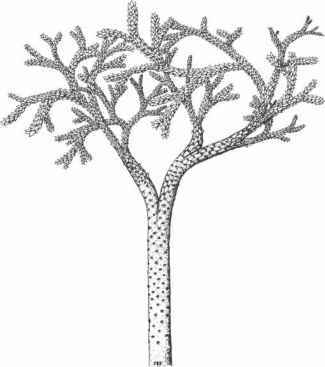 (2005) provided a reconstruction that depicts the plant as a monopodial tree, 10-25m tall and 0.3-0.4 m wide at the base, which produced lateral branching systems by pseudomonopodial branching of the trunk, rather than by equal ramifications as formerly thought. Branches grew by means of isotomous dichotomies. The lateral underground portion is believed to have been Stigmaria like. Carboniferous ones, which are ligulate and possess parich-nos scars (Jennings, 1972). Only compressed specimens are known, and they include stems up to 3 cm in diameter. Helically arranged, quadrangular-hexagonal leaf cushions cover the stems. Each cushion bears a rhombic leaf scar at its apex; ligule and parichnos scars are absent. Unlike the majority of arborescent lycopsids, which possess narrow, linear leaves, Valmeyerodendron has leaves that are nearly triangular in outline with a constricted base and attenuated apex. Eskdalia is a Mississippian ligulate lycopsid with expanded leaf cushions (FIG. 9.95), each with a conspicuous keel (FIG. 9.95) (Thomas and Meyen, 1984a). 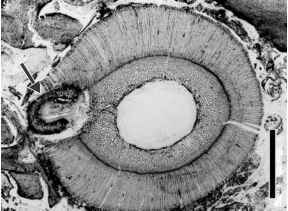 Rowe (1988a) indicated that stomata are absent from the cushions in E. variabilis and suggested that they functioned in support, rather than as photosynthetic organs, as has been documented for certain arborescent lycopsids (Chaloner and Meyer-Berthaud, 1983).